Ritron Callboxes - What’s A Callbox? A callbox is literally a box, equipped with a special purpose radio that can communicate with a two-way radio network or a dispatch office. They are used in a variety of industries as a way for customers, employees, or visitors to communicate from a remote location to an existing radio network or central office. Ritron callboxes all use radio frequency technology, therefore have the advantage of being wireless, which allows for much more flexibility with installation and location. Ritron carries a variety of callboxes designed for use in many applications. 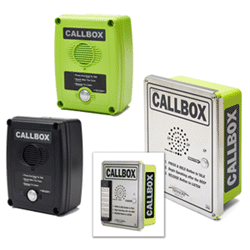 Our workhorse is the XT Callbox, heavy duty with a fiberglass enclosure and a steel faceplate. These are in use in rough environments, and stand up to weather and harsh elements. Typical applications may be on a plant floor, delivery dock, or a gated entrance. These are available in VHF (both business band and MURS), and UHF in analog frequencies, and our digital models include both DMR and NXDN protocols. The Q Series comes in high visibility green or a black polycarbonate case. This callbox is used on construction sites as a hoist intercom system, and can also be used at loading docks, gate entrances, and golf courses, as well as on high school and college campuses. The Q Series callboxes are also available in VHF (both business band and license-free MURS), and UHF in analog frequencies, and our digital models include both DMR and NXDN protocols. Our customers appreciate the fact that these boxes use wireless technology. This saves them untold costs when compared to the cost of trenching for a wired system. Flexibility on how the system is installed is increased, and there is no need to deal with the OSHA regulations for cutting through concrete and asphalt as would be required in a typical wired system. The distance radio communication covers is also highly cited as beneficial to our customers. Distances measured in miles, not feet, Ritron callboxes communicate with your existing network of handheld or base station radios with reliable RF technology. Ritron callboxes are available in analog or digital. This means they are compatible with your existing radio network. You choose the frequencies appropriate for your application. Our callboxes were designed from the ground up as special purpose radios, and are not simply an existing portable radio packaged inside an enclosure. These callboxes are used at gated entrances to factories, at loading docks, on a factory floor in safety applications, on golf courses to call for assistance or even order food, on construction sites as hoist intercoms, to greet visitors at gated entrances, and in wide variety of safety and production environments.